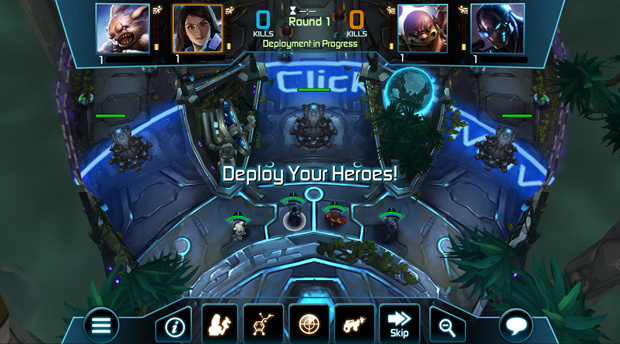 Arena of Heroes is now in open beta, and is essentially a turn-based DOTA game that pits players against one another through matchmaking. With the recent announcement that PWE would be picking up the title as one of our mobile line launch games, I was given the assignment to check how ready Sneaky Games was for the big time. 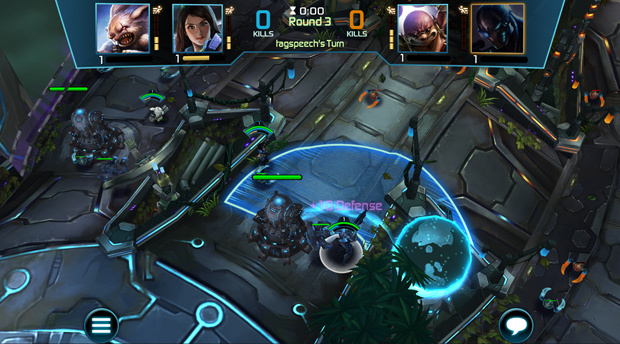 Individuals are expected to use the game’s premium currency to unlock new skins and new characters, much like League of Legends and similar titles. The big difference here is, once again, that the game is both turn-based and squad-based – individual matches feel more like a game of wacky chess than anything else. The character roster is colorful, but initially limited. Players are able to increase levels and earn rewards through gaining fame, which is awarded after victories. 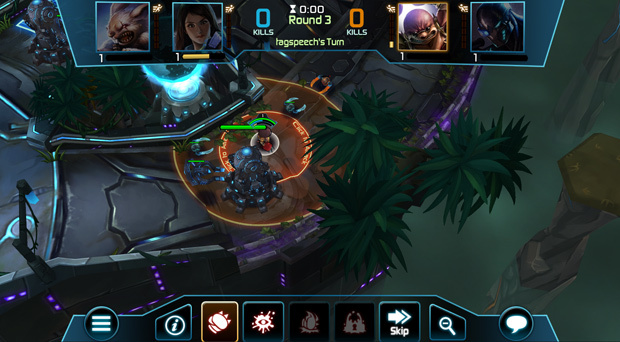 The game fortunately allows for a lengthy tutorial and plenty of practice matches, but some players may find the game’s slow-pace and unusual approach to competition a bit off-putting. This is certainly going to be a niche title. And fans of anthropomorphic animal people wearing human clothes will certainly enjoy the game, because there’s plenty of that. There’s even a mole person with beefy forearms who smashes things, has terrifyingly bushy armpit hair, and wears John Lennon glasses. Truly, there’s something for everyone in Arena of Heroes. More on that: it’s just difficult for me to imagine who this game is targeted to. If it’s targeting the turn-based strategy fans, then why use such a limited system? 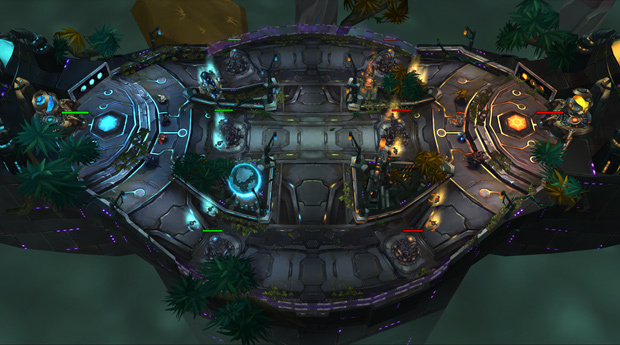 As it stands, the game feels like someone took an RTS strategy game and shoehorned in a turn-based element. I don’t know who would enjoy that. As a big fan of squad-based strategy games like XCOM, on paper I should like this kind of thing, but the lack of a coherent grid for planning movement and attacks feels strange. There simply needs to be more to it than this, like actual cover mechanics or using terrain to one’s advantage. It’s difficult to do that when attack ranges are so limited. Normally I’d be the kind of person to play a more patient, defensive game when it comes to turn-based strategy, but even my “sniper” couldn’t attack beyond a stone’s throw distance. He had an overwatch mode (allowing him to attack the first enemy that comes into his attack range) but again, limited range, and limited only to that character. All in all, the game just feels plodding and confused, like it just doesn’t know what it’s trying to accomplish with itself. Why not just create yet another active, MOBA/DOTA style of game wherein players select their favored hero, jump into an arena, and go nuts? This one vs. one squad-based stuff is for a real niche of patient, older gamers who are more likely to actually play something like chess, Civilization, or another cerebral strategy game in their spare time. Therefore, the question has to be asked, why don’t those players just go off and play those games instead of Arena of Heroes? Why exactly, in this era of extreme competition, would I want to play Arena of Heroes? Perhaps these questions will never be answered. To that, my answer is this: No. But I’m just one person. Sure, I may not be the kind of person who obsessively enjoys matchmaking PVP strategy games, but I know plenty of people do. And sure, maybe I’m not the biggest fan of whimsical, goofy characters; but plenty of people are. I can’t speak for the entirety of the gaming community, but that still leaves the fact that I am struggling to figure out who this game is for. So, it’s too early to tell exactly how successful the game is going to be upon official release, it has been garnering a bit of attention from tired DOTA and LoL fans who are looking for a change of pace. The whimsical character roster (a hillbilly rabbit with a minigun, anyone?) and easy-to-use matchmaking system are its best points, but so far it seems that the game needs a little extra ‘oomph’ in the combat to make it more engaging for a wide audience. If they want it to be a niche title, then they’re going to have to make the combat a lot more complex and tactical. Either way, serious decisions need to be made by the game’s developers, or Arena of Heroes won’t attract (and keep) enough attention to stay afloat. The Dark Harvest has begun in Ramsgate, and the city has been shrouded in an unrelenting night. With it comes the mysterious cult, The Unseen. Business Tycoon Online, a browser based business simulation MMO, will enter closed beta on January 5th.